Is Intelligent Automation Really In Our Future? Autonomics and robotic process automation are heading in that direction. Cognitive computing and artificial intelligence, along with natural language processing and emotional recognition, further that promise. Machine learning or deep learning (you choose!). Intelligent APIs. Neural networks … the list goes on. This is the evolving lexicon of intelligent automation. Sure, it’s a little overwhelming (in fact, we might need a robot to help us figure it out). But the fundamental premise is simple: technology can extend human capabilities — automating, accelerating, and amplifying how we deliver solutions in business and beyond. What Is Intelligent Automation Anyway? The idea of intelligent automation is still new. Today’s debate is about how to define the market and its potential. Service providers are still developing and defining solutions and scoping markets, but clearly, intelligent automation technologies present an array of opportunities for CIOs, business unit executives and leaders of shared services groups, and functional areas such as human resources, finance, and supply chain. For a while, anyhow, it likely won’t mean drafting blog posts (and almost certainly not poems), but it will mean auto-generated, intelligent emails compiled from an evolving set of answers to different types of conditions, questions and challenges. It will mean intelligent data-processing and feedback capabilities enabling information systems to automate decision-making and deliver services faster, more cost-effectively and error-free. I don’t know about you, but this seems like too big of an opportunity to miss out on. However, the thought of entering this new area of change can be daunting, to say the least. We’re all learning how different applications can be designed, built and implemented across business. Now businesses need a simpler rubric for understanding and applying available technologies. Systems That Do accelerate workflows. By employing intelligent systems, organizations can lessen or eliminate the need for human involvement, proactively managing applications to keep systems running around the clock, handling multiple communications channels and large volumes of data. Systems That Think are cognitive technologies like automated intelligence. These synthesize huge amounts of data and provide insights that drive critical decision-making. Importantly, once deployed these technologies adapt and evolve over time rendering smarter operations and ever richer analytics. Systems That Learn include artificial intelligence — advanced autonomous thinking systems that provide process intelligence for staying competitive. Systems that learn anticipate, predict and ultimately prescribe optimal courses for future actions. Do. Think. Learn. Simplifies the conversation around intelligent automation. It is important to have an approachable framework like this to guide development and delivery for rapid customization of pre-configured, industry-specific solutions that scale on-demand. Don’t worry, even though the automation spectrum is constantly advancing, making laws and writing poetry will still belong to humans. But intelligent devices allow us to integrate automation systems, bringing together technologies, methodologies and expertise. The future looks bright. Thoughts? Comments? Suggestions? Drop me a line on LinkedIn. No ‘bot required. 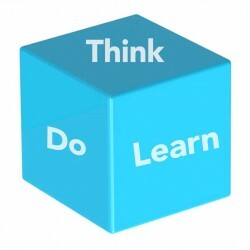 Or visit digitally.cognizant.com for more on the Do, Think, Learn spectrum, including my thoughts on the next step in the continuum — machines that adapt.